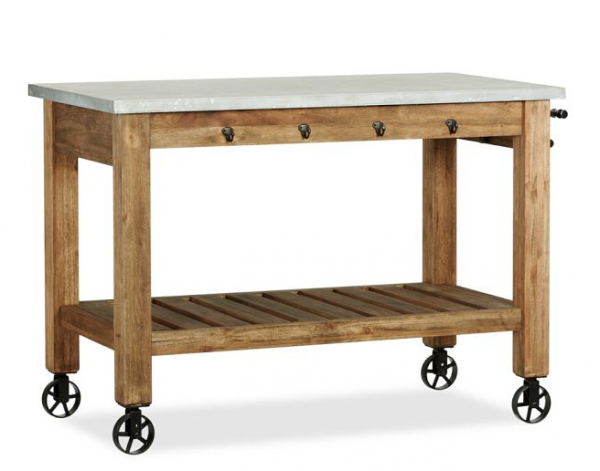 Do you have a freestanding kitchen island? Prior to my kitchen “remodel-rearranging” I had a u-shaped kitchen with a breakfast bar. Now that we’ve removed that bar and part of the “u,” I have space in the middle of the kitchen for an island! But rather than having a built in island (at least for now, since we are try to keep this kitchen remodel budget under control) we are going to use a freestanding island we already had, perhaps with a little creative embellishing. It is fun to look at inspiration pictures to see how you could embellish a piece of furniture to suit your own needs in an island! 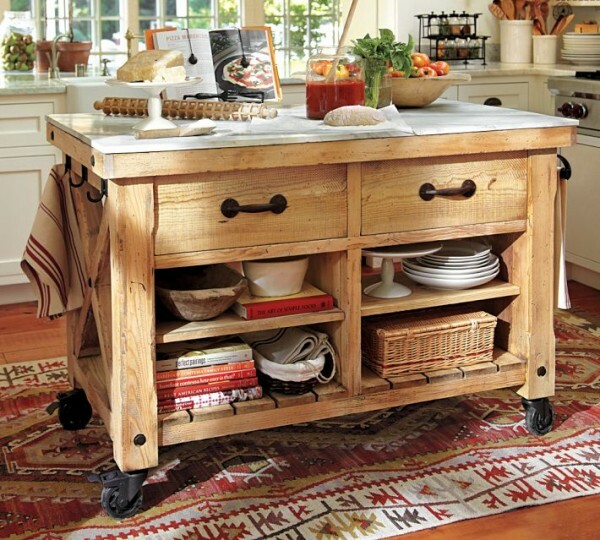 Update: See more inspiration for freestanding islands and carts here! 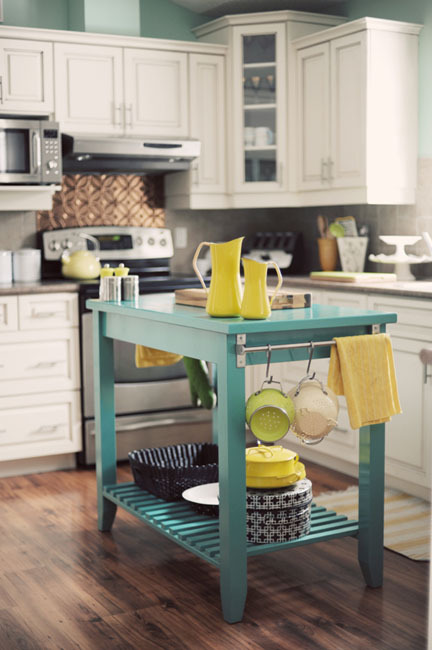 Do you have a freestanding island? See my freestanding island makeover here! 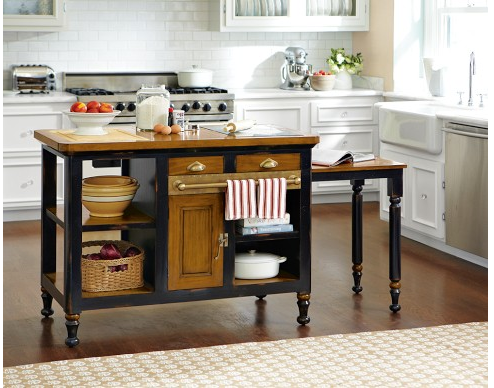 I think kitchen islands are the heart of the home, where everyone gathers. 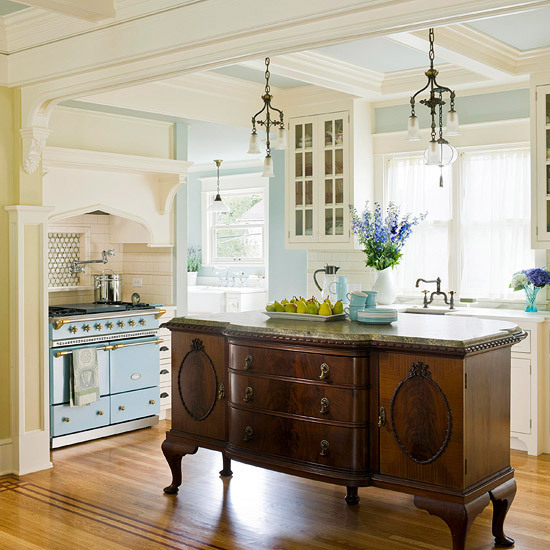 We are just about to redo our kitchen, and will be adding an island – I can’t wait! Yes, I do. I turned an old, dark sideboard into a kitchen island about 3 years ago and it is lovely. Also – it’s pinned a lot on Pinterest. In my current home my island is built in (same cabinetry as the kitchen cabs) but in my previous homes I’ve had free standing. One island was an old dresser that we fitted with a butcher block top. I loved all the drawers (great storage). It is currently being used in my breakfast room as a sideboard. And the other island was a stainless steal table that my husband brought home from a mushroom farm. That one was great for rolling out pie crust or pizza dough because it stayed cool. It also cleaned up real easy. We still have that one also and is being used by my husband to clean fish. We never get rid of anything. I love freestanding islands. We used a free-standing island at our farm and went that route again in our new house. I am in LOVE!! It’s even better than the last one. Even better, it was custom made at a local shop using reclaimed doors, corbels and window casings. It’s hand-distressed, a happy turquoise color. It totally makes the kitchen! I don’t have a freestanding island but we put legs on it to make it look like furniture. Love the pictures. Thanks for sharing. Islands make such a big difference in a kitchen. I just transformed an old buffet into an island(with a little help) and love it! Below are the 2 posts I wrote on how we did it and the final decision for the top. It’s fun to so something just a little different especially with a piece that can be such a focal point in a kitchen. They are all so nice and I think they would be handy although I’ve never had one. I saw one on UpHome website that I want so bad but that would be a total kitchen remodel and that won’t be happening any time soon. 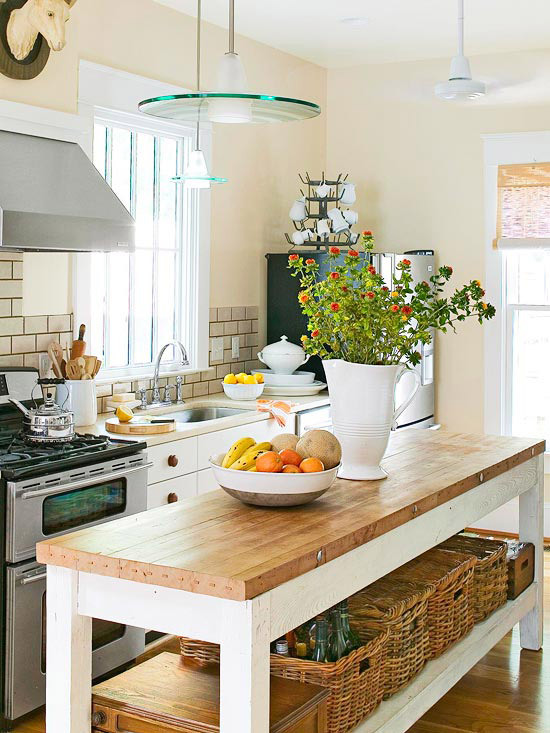 I love the butcher block with the orange flowers in the vase, gorgeous! ohhhhhhh how i love a kitchen island! 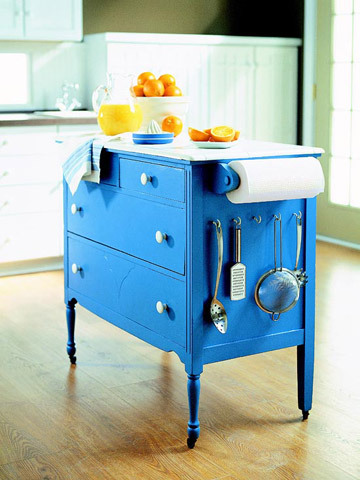 Such a great way to get extra space and storage…and add a fabulous pop of color!! Your post comes at a perfect time as I am trying to design a kitchen island on wheels. I have a galley kitchen and do not want the island there at all times – I want to roll it to sit in front of a window in our breakfast room. I love the PB one with the X’s on the sides. WOW – everyone you found tho is awesome. Thanks so much!!! I am just about to make a freestanding island myself! We just moved into my childhood home this month. In the backyard I found a long weathered wood patio table that my dad built over twenty years ago. One day it dawned on me that it might make the perfect kitchen island if I paint it, add some casters and a butcher block top. I’m excited about it because I think it’s going to look great and function well, but also because I love its sentimental history. p.s. all of your imagery helped me feel more confident that it’ll work great — and that I’m not crazy! Our freestanding island came with the house but we love it. Because it’s open at the bottom it helps keep the whole kitchen (which is small) light and airy. When you walk in the back door (which most people do), it is the first thing you see when you walk in the house so it’s important to keep it open. We are going to be updating the kitchen and we’re going to replace the maple top with a walnut one. Thanks for the island inspiration today! 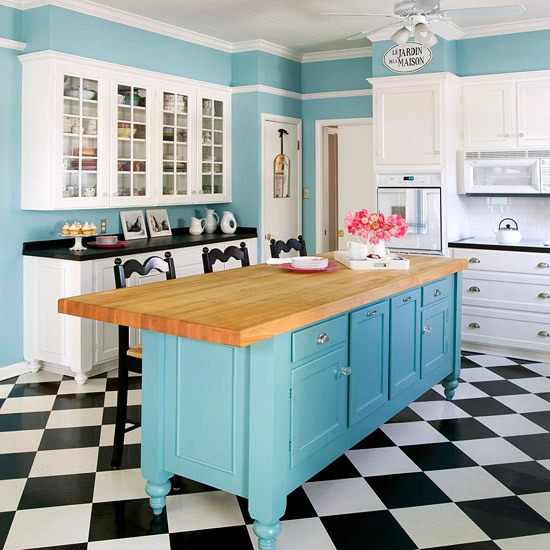 We are planning a freestanding island for our newly remodeled kitchen, and we need all the inspiration we can get! Love these! I don’t have room for one of these in my current kitchen, but I’m hoping that some day in the future I will have the space. 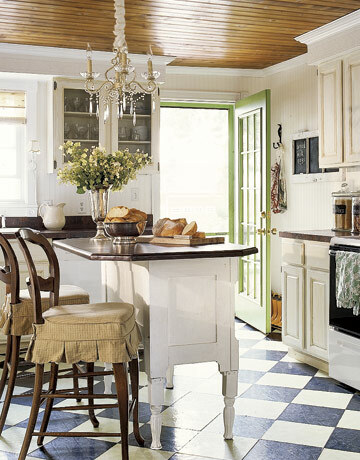 I especially love the islands that are painted in a bright color, adding such a nice pop to the space. 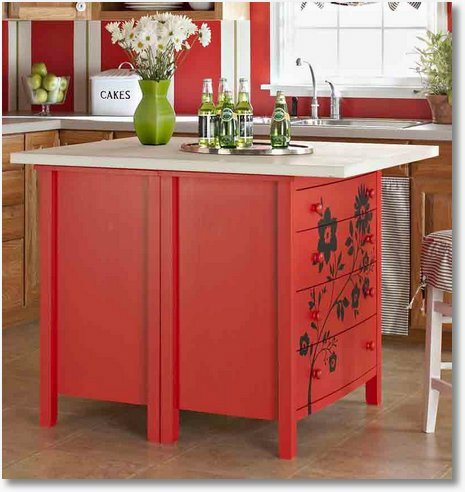 I have always wanted a kitchen island. However….none of my kitchens have had the right footprint to have an island. :-( BUT….that hasn’t stopped me from dreaming and pinning. I can’t believe how many dreamy islands in this post I have already pinned. I think a freestanding island is a great thing! Except when someone leans on it thinking it’s nailed to the floor…LOL! They really give lots more opportunity for creativity! And there…I think you’re gonna shine!!! I, too, once had a peninsula. I never liked it. We (finally) removed it and swung it around and out against the wall (where your door is) and added a small glass cabinet for display. I have avoided a permanent island because I didn’t want to travel “round and round” an island instead of across my kitchen to have access to my cabinets. Because “Flexible” is my middle name, I chose a freestanding table with casters so I am able to move the table whenever and wherever it works best. My table measures 15×36″ with very large flip up (1 or both) sides so I can vary the surface space. This table is SO versatile; sometimes I move it against a wall to have the floor completely open, sometimes in the middle of the room for working on a cooking project, and at Christmas, I move it near the end of the kitchen so all 12 of us can move about the space easily for our Cookie Bake. I have even moved it to the hallway to use it as a cooling rack for many many dozens of cookies. Yes, Flexible is the most important thing for me. I hope you find the best table for you! Can’t wait to see yours!! I LOVE a freestanding Kitchen Island! Searched for years for just the right one for my DIY Kitchen Re-Do and my sister found me one in Brimfield this past spring. Needed some major cleaning up and refinishing but the end results were perfect! I don’t have a blog so I am going to try to link to my flickr account so you can see the photos…Hope it works! I’ve got a hoosier,minus the top unit. We are looking for bigger wheels to raise the height some. I’m only 5′ 2” so it doesn’t have to bee as high as the counters. We are going to paint it midnight blue because all the cupboards are white. I want a wooden towel bar as well. Thanks for showing us lots of ideas. 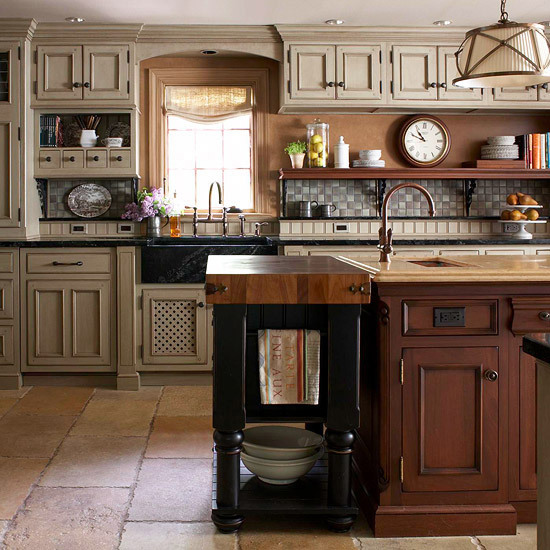 These are beautiful kitchen islands :) #1, #2 are my favorites! Since our last house had a built-in stationary island and we found it so useful, we were happy that our new house had one, too. However, the new one had the stove-top in it and was placed awkwardly in the space, so we eventually took that island out and replaced it with a moveable island which we purchased, I believe, from Ballards (although they no longer show it on their site so it must be discontinued). It is a wonderful island with drawers and cabinet doors that open on both sides. It also has extensions (which we do not use) on either end to make it an eating space if wanted. It is black and designed to look just like furniture and could be used elsewhere in the house as a sideboard or occasional table. We purchased a manmade resin slab on top to protect the piece, but the top is actually painted wood and could be used without the topping. We are soooo pleased with the contrast between our oak cabinets and the black island and the handiness of having the extra drawers for dishtowels, pot-holders, and casserole dishes in the cabinet! The piece really dresses up our kitchen and makes it one-of-a-kind. Thank you! 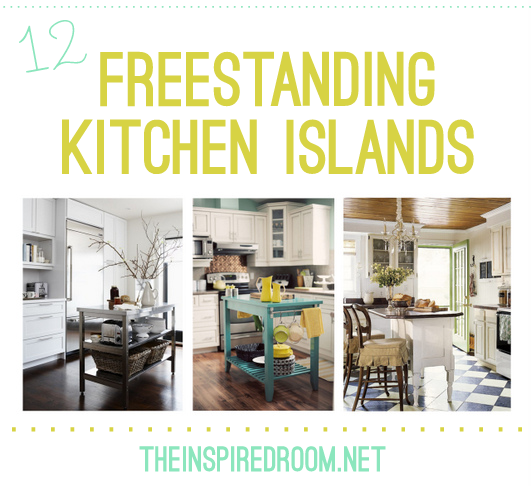 I actually never thought about free standing islands but after seeing all this inspiration, if I were to get one, I know exactly what I would want! OK….so for me, hands DOWN!! The BHG antique buffet island. GORGEOUS!!! LOVE it! I am almost relieved that at least a few of these designs likes to show PC’s love. Keep the ‘Where I Work’ articles coming! I actually just pinned some free standing kitchen islands, as I want to add one to the house we are close to closing on (it’s a short sale so who knows for sure when we close…) Here’s the link to where I’ve pinned some crush worthy island and they seem very reasonable!! I love islands – these are some wonderful examples! But our kitchen truly is too small for one. Sigh. I like the one with wheels on it. A very unique kitchen island. I’m really inspired to work on some things for my kitchen.